> As wavelength decreases - wave height increases. Water particles move in a circular pattern - but the energy of the wave moves forward. The circular motion of the water particles is smaller in deep water. > Wind comes from the weather systems created by energy from the sun heating our oceans. > Ocean waves are made by the friction of the wind passing over the sea. 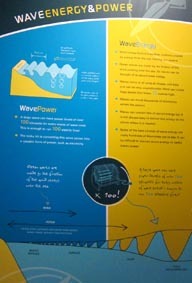 So waves can be thought of as stored solar energy. > Waves come in all sorts of shapes and sizes and can be very unpredictable. Wind can create huge waves that tower 15 metres high. > Waves can travel thousands of kilometres across the oceans. > Waves can contain lots of stored energy but it is not always easy to deliver this energy to the places where it is needed. > Some of the best sources of wave energy are many hundreds of kilometres out to sea. It can be difficult to convert ocean energy to useful ocean power. 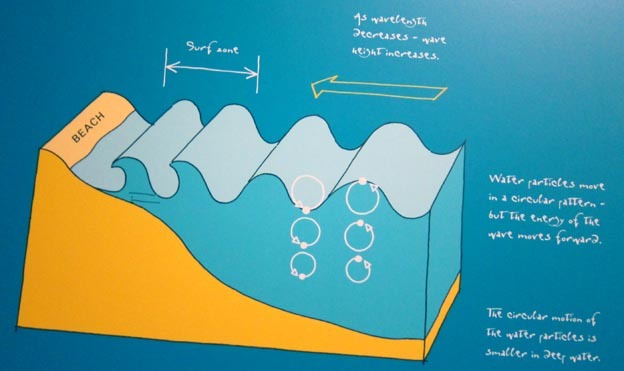 > A large wave can have power levels of over 100 kilowatts for every metre of wave crest. This is enough to run 100 electric fires! >　Fetch is the distance over which wind-driven waves travel without obstructions.